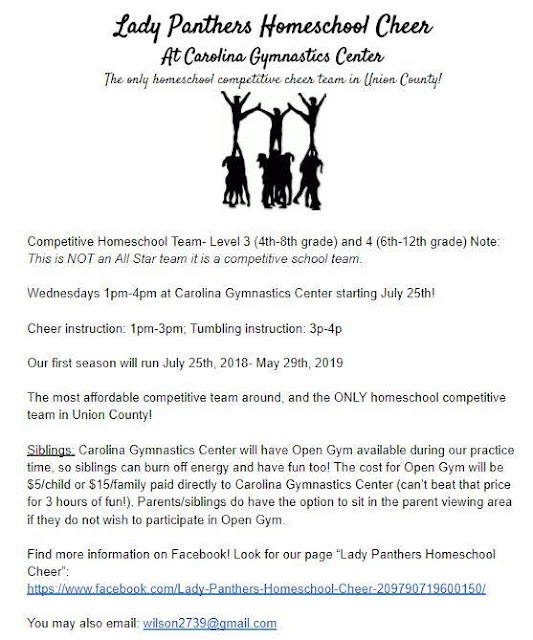 The Lady Panthers Homeschool Cheer is a great opportunity for competitive cheer provided by homeschool mom, Lindy Wilson and all the volunteer coaches by providing an affordable option that meets during the day! Lindy has coached cheer/dance/tumbling for almost 15 years, and has put together a team of homeschooling moms with experience teaching and coaching who are willing to volunteer their time too. "This program will be affordable ($20/month) because all of the coaches are volunteering, and the only cost is the fee for the facility. You can't find a 2-hour cheer class and 1-hour tumbling class (3 hours/wk class) for $20/month any where! If we end up with more than 25 girls the cost will come down even more (we are simply dividing the fee for us to use the facility for 10 months by all the girls who are participating). This is so great Lindy! Thank you! You can CLICK HERE FOR THE REGISTRATION PACKET!